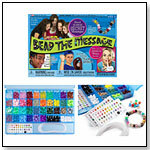 This patent-pending kit of nearly 1,000 beads features various colors that each represent a letter, number and space, so that kids can create bracelets and other accessories with their own secret messages to be decoded. The kit includes 20 decoder cards, 15 feet of lacing with closures, labels, and instructions. Awards: 2010 WTS "What The Stuff" Five Star; A TDmonthly Classics Award for being an all-time favorite toy. Ben 10 Ultimate Omnitrix by BANDAI AMERICA INC. Kids use the mini translucent figures to unlock alien lights and sounds. The Ultimate Omnitrix comes with one mini translucent figure that attaches to the base and unlocks the alien's special image and sound. Kids can collect all 10 mini translucent figures — each one unlocks its own unique holographic figure and sounds. Launch date: July 2009. Featuring a cover image of a strong horse running in a field of flowers, this diary contains 240 colored pages with lines for writing. It includes a lock with two keys and measures 6 3/8” x 6 ¼” x 1. — In fall 2009, three of 39 retailers named journals and diaries as best sellers for tween girls. — Diana Nelson, owner of Kazoo & Co. in Denver, told TDmonthly her store sells 8 to 10 journals from Peaceable Kingdom Press each month. 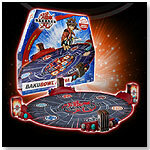 The Bakubowl Arena from Spin Master brings together kids and their Bakugan Battle Brawlers together for a fast-paced game. Stored in stations behind the Bakuramps around the edges of the circular arena, Bakugan wait to be launched into battle by the ramps where they will strive to win against their opponents' team. The arena accommodates up to four players. 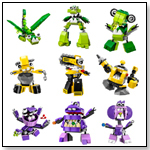 — “Bakugan Battle Brawlers is flying off the shelves,” Katherine L. King, manager of Giggles Toys & More in Bozeman, Mont., told TDmonthly about her best-selling gifts for boys in June 2009. Printies™ Design Studio kits and refill packs are created as affordable at-home activity kits that allow children to take their online design creations offline like never before. Using their home PCs, inkjet printers and special patent-pending Printies™ fabric sheets, children can bring their online designs to life as soft, 3-D, collectible stuffed toys. It’s simple: they design online at MyPrinties.com, print on both sides of Printies fabric sheets with any inkjet printer, tear along the perforated shape and pop out the Printies design, stuff it, and put it on display. Launch date: Fall 2009.